The Korean Medical Association has urged the government to revise the Emergency Medical Service Act to protect doctors who assist an emergency patient from liability. The KMA’s demand came after a family medicine specialist was sued for allegedly missing the timing to treat a woman who died due to an allergic reaction to bee acupuncture at an Oriental medicine clinic. If doctors had no intention to hurt patients, they should be given full exemption from liability for an injury or death caused by their first aid regardless of the seriousness of the medical error, the KMA said. Korean Medical Association President Choi Dae-zip (center) speaks during a news conference to call for exempting Good Samaritan doctors from liability in Yongsan, Seoul, Wednesday. At Choi’s right is KMA Spokesman Jeong Seong-kyun (left), and at his left is KMA Legal Affairs Director Kim Hae-young. 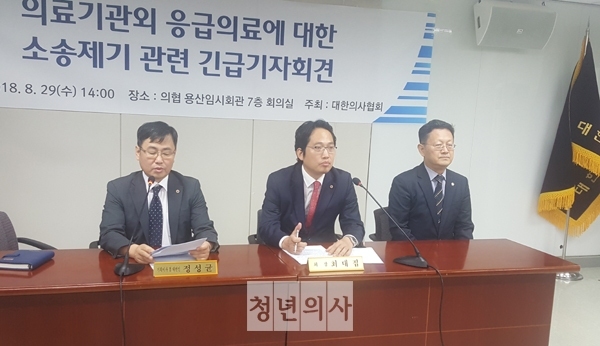 KMA President Choi Dae-zip said the current law should be amended so that “Good Samaritan” physicians can be protected, in a news conference at the KMA’s temporary hall in Yongsan, Seoul, Wednesday. Medical professionals either receive help requests or voluntarily help emergency patients, Choi said. He lamented the current situation, in which the doctor who gave first aid should prove that the doctor made no mistake if the emergency patient gets injured or dies. If the doctor fails to do so, he or she is subject to civil or criminal punishment, he added. “It is nonsense to ask whether a doctor’s help with good intention was negligent or not. If the doctor had no intention to hurt the patient in an emergency, the doctor should be exempted from liability,” he said. The KMA head said he would provide legal support for the family medicine doctor, who faced a 900 million won ($810,000) civil lawsuit after helping the patient of an Oriental medicine practitioner. “We are reviewing to pay the expenses for appointing a lawyer for the physician,” Choi said. If the physician faces unfair punishment, no doctor will come forward to help an emergency patient, Choi added.